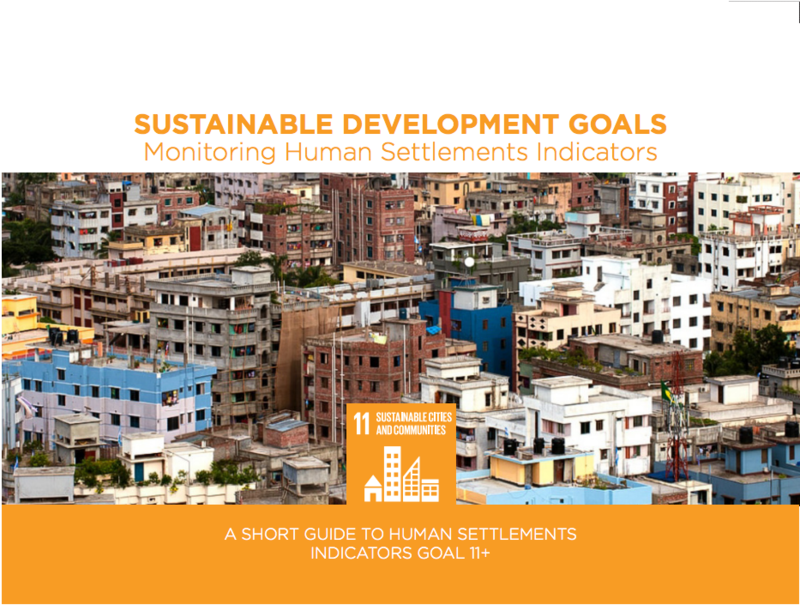 The human settlements goal measures the proportion of people living in households who do not meet one of the five following housing conditions: (1) access to improved water; (2) access to improved sanitation facilities; (3) sufficient-living area (not overcrowded); (4) durable housing; (5) and security of tenure. 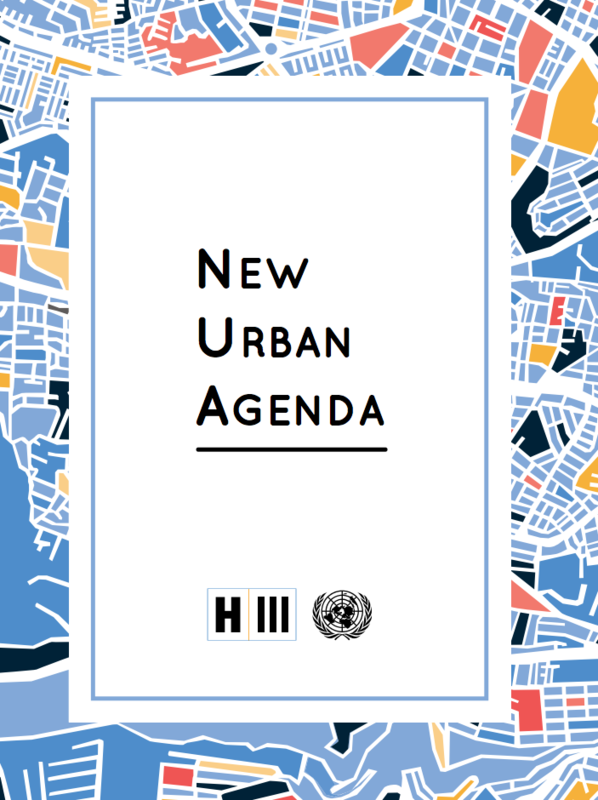 Urbanization is one of the most significant global trends of the 21st century. Rapid urbanization without proper planning and governance mechanisms, however, can lead to tenure insecurity and spatial inequalities. Expanding slums and informal settlements increase poverty, pollution, health, and environmental risks. Displacement from urban development can lead to food insecurity, loss of community structures, and the marginalization of certain segments of the population. It is thus essential to collect data on the proportion of the population living in slums, informal settlements or those living in inadequate housing so that appropriate policies for addressing housing issues can be developed. 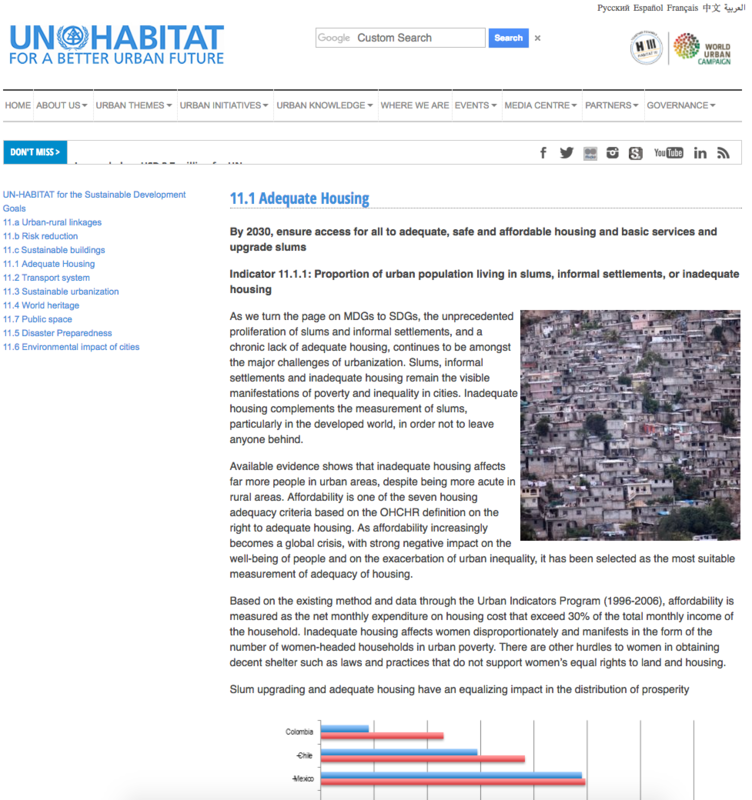 See the metadata document for SDG Goal 11 created by UN-Habitat. Formalization of urban residential housing is feasible and affordable measured on a scale from A - which stands for good practices - to D - reflecting weak practices. 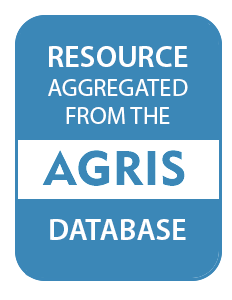 Individual land in urban areas is (i) recorded and (ii) mapped measured on a scale from A - which stands for good practices - to D - reflecting weak practices. The indicator measures the total number of farm households located in urban areas in Lao. The data comes from the Lao Census of Agriculture 1998/99 and 2010/11. Process to improve informal settlements exists measured on a scale from A - which stands for good practices - to D - reflecting weak practices. Transparent process to formalize unchallenged land possession measured on a scale from A - which stands for good practices - to D - reflecting weak practices. Leer más sobre 7.5 billion and counting: How many humans can the Earth support? From 11-14 November in Bahrain, decisions are being made that will influence priorities of governments around the world. In September 2015, at a meeting of the United Nations General Assembly, 193 countries endorsed the 2030 Sustainable Development Goals – known as the SDGs or Global Goals. This collection of 17 ambitious goals and 169 targets form a framework to address the global challenge of eradicating poverty. "We think it's a crisis when one-in-three households - one-in-three citizens that live in cities - don't have adequate, secure or affordable housing"
As we turn the page on MDGs to SDGs, the unprecedented proliferation of slums and informal settlements, and a chronic lack of adequate housing, continues to be amongst the major challenges of urbanization. Slums, informal settlements and inadequate housing remain the visible manifestations of poverty and inequality in cities. Inadequate housing complements the measurement of slums, particularly in the developed world, in order not to leave anyone behind. As of 2017, the City of Cape Town offers little support to residents who will become homeless because of eviction, except a one way ticket to a relocation camp on the periphery of the city. Good law led to a clear obligation to provide temporary emergency accommodation but was very poorly implemented. Relocation camps on the periphery isolate residents from community networks and affect their ability to access good services and income. Today, more than half the world’s population lives in cities. By 2030, it is projected that 6 in 10 people will be urban dwellers. By 2050, the figure will have risen to 6.5 billion people; representing two-thirds of all civilization. Taking into account the increasing rural to urban migration and the rapid growth of cities in the developing world, it is clear that cities face a myriad of problems that may hinder planned growth and development. This paper discusses the role of energy provision in influencing the social aspirations of people living in slums. We examine factors that influence the shift in aspirations in five slum settlements using data from 500 interviews conducted in serviced and non-serviced slums from the state of Gujarat in India. The non-serviced slums did not have access to basic services namely water, sanitation, energy, roads, solid waste and rainwater management. The Indicator is conceptually clear, has an internationally established and available methodology and standards, and that data is regularly produced by countries for at least 50 per cent of countries and of the population in every region where the indicator is relevant.